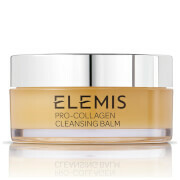 ELEMIS PRO-COLLAGEN CLEANSING BALM Super cleansing treatment balm 105g, a luxury deep cleansing facial balm. Designed to soften and smooth the skin whilst deep cleansing, ELEMIS PRO-COLLAGEN CLEANSING BALM is a balm-with-a-difference. A signature blend of Geranium Flower Oil, Camomile Flower Oil, Eucalyptus Leaf Oil, Ho Wood Oil, Orange Oil, Clove Leaf Oil and Menthol, are blended into the highest-quality Wheat Germ and Oat Kernel oils with Starflower Oil and Elderberry Seed Oil and fused with a base of Mimosa Flower and Rose Flower waxes; creating a luxuriously soft balm to dissolve make-up, daily grime and pollutants. Skin is intensely cleansed, nourished and renewed for a glowing complexion. Suitable as a daily facial cleanser or as a cleansing face mask. Active Ingredients: Mimosa Flower Wax, Rose Flower Wax, Starflower Oil, Elderberry Seed Oil, Optimega Oil, Coconut Oil, Shea Butter, Sweet Almond Oil, Padina Pavonica, Vitamin E.
Treatment Type: Deep Cleansing and Nourishing Facial Cleanser. A suitable replacement for, the discontinued, Elemis Melting Cleansing Gel 125ml. ELEMIS PRO-COLLAGEN CLEANSING BALM Super cleansing treatment balm 105g was found on 4 websites and was price compared using EAN: 0641628001736. 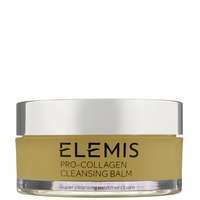 The cheapest ELEMIS PRO-COLLAGEN CLEANSING BALM Super cleansing treatment balm 105g is shown as the main item, prices range from £29.95 to £43.00, excluding delivery. Price comparison based on price and delivery charges, with any valid discount codes being applied, is shown in the table above. Prices and information correct at the time of publication.